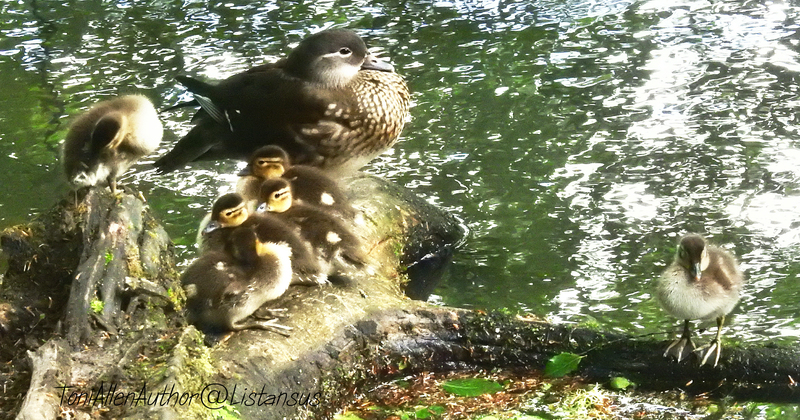 I’ve had a busy day but really wanted to share this lovely family of Mandarin ducks with you. They breed at the same location, Waggoners Wells near Grayshot, Surrey, every year and I’m so excited to see that this year they have six healthy ducklings. It was a really gloomy day hence the photos aren’t too hot but it gives you an image of the whole family – except Daddy Duck, who was nowhere to be seen. I spotted the Mandarins just after they’d finished their feed time and needed a rest. Once they get on the water they are so fast, much faster than Mallard ducklings and to my mind much more intelligent as well. With any luck I’d get some photos of them scooting across the water next time I visit.